FREE AND OPEN TO THE PUBLIC! BRING YOUR BICYCLES! Grab some friends and pedal on over for an evening celebrating all things bicyclistic! Free festivities include bicycle portraits, a screening of the 1983 Australian action movie BMX Bandits (starring a young, not-yet-famous Nicole Kidman), bicycle-centric crafts, and free admission to LLYN FOULKES. Guest hosted by artist and bicycle enthusiast/activist Lisa Anne Auerbach. Pedal Promenade – Biking is just as much about fashion as function. Show off your bike-styles on the Pedal Promenade. Cash Bar – Enjoy Fat Tire draft beer and food-on-the-go from Ammo Café. A second bar is located on the Gallery Level. Info Tables – Keep up with the latest information on the growing bike communities in Los Angeles from METRO, Los Angeles County Bike Coalition and HAMMER Student Association info tables. Interactive Map – Share your biking landmarks with your peers and tell us about your favorite bike shops, routes, collectives, and more. Map it, pin it, Post-It or draw it all directly onto the map yourself. Bicycle Repair Station – Pop a tire on the way over? The UCLA Bike Shop is offering free, basic bike maintenance. 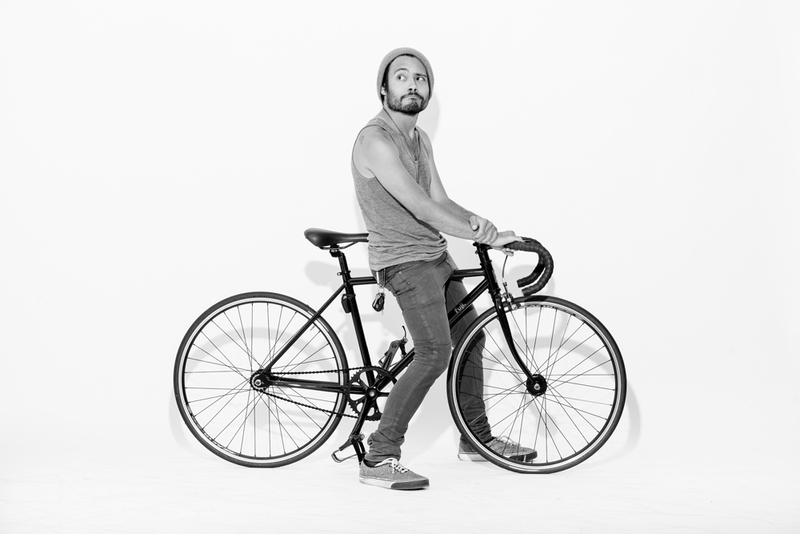 Bike Portraits – Smile! Have your portrait taken with your trusty mount and we’ll upload it to the Hammer Flickr and project into the South Courtyard. To download your portrait visit the Hammer's Facebook Page. Bespoke Spokes – This VIP parking area doubles as an exhibition of custom and art bikes for all to admire. GOLDEN TICKETS will be handed out at Hammer’s Lindbrook Entrance to select individuals with unique, outrageous or eye-catching rides. The Squeaky Wheel – Rant and rave about all of your bad and good biking experiences in LA in our video booth. Clips will be edited into a PSA-style documentary video for the LACBC. 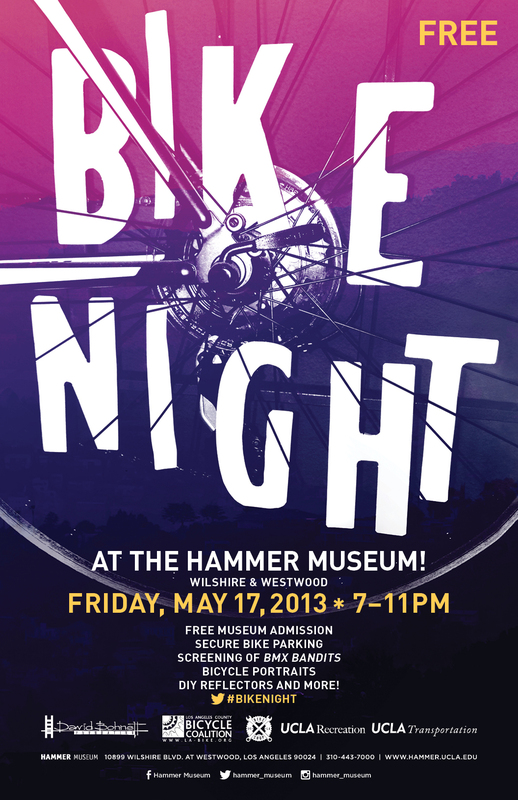 All night with LACBC in The Lab (pssst – it’s under the stairs to the Gallery Level). Exhibitions – Check out some art in the HAMMER’s galleries. All exhibitions are FREE and open till 10pm. Cyprien Gaillard is located in Gallery 6. More exhibitions on Gallery Level and in our Wilshire Lobby. Cash Bar – Enjoy Fat Tire draft beer and food-on-the-go from Ammo Café. A second bar is located in the Hammer Courtyard. D.I.Y. Reflectors – Combine fashion, fun and function by making your own custom reflectors and stickers. Located on the west side of the Lindbrook Terrace. Balloon Sprints – Like Goldsprints, but hopefully no puking. Race a friend to see who can fill and pop a balloon first using pedal power. Located on the west side of the Lindbrook Terrace. People generating power, created by the clever folks at Metabolic Studios. Party Bike – Give it a spin! Everyone knows that pedal power makes you feel good; especially when you’re powering a bubble maker that’s raining down orbs of joy on your fellow Bike Nighters! Located on the west side of the Lindbrook Terrace. Good vibes, courtesy of the good folks at Metabolic Studios. Silk-Screening – Choose from four unique artist designs to adorn your own tee, safety vest, back patch or hoodie. Screened and dried on-the-spot by the UCLA Transportation Department, friends to cyclists all around Westwood. Ping-Pong – Put some backspin into your backhand and return that loop with a lob. Skunks welcome on the tables tonight in light of all our other activities. Exhibitions – Check out some art in the HAMMER’s galleries. All exhibitions are FREE and open till 10pm. LLYN FOULKES is located in Galleries 1 & 2. More exhibitions on Courtyard Level and Wilshire Lobby. Museum Store – Peruse or purchase a wide selection of art-related publications and gifts in our unique retail environment. Open till 10pm. The Hammer’s North entrance on Lindbrook Drive will be wide open to bicyclists who want to ride right in and park at our guarded racks (but please bring a lock). Automobile parking is available under the museum for a flat fee of $3 after 6PM.